X2O Media has partnered with Park Nicollet Clinic – Champlin in Minnesota to implement a comprehensive digital signage network designed to facilitate interaction with patients and staff throughout the healthcare facility. The dynamic network augments the clinic patient and guest experience with on-demand video content, provides interactive wayfinding, and highlights social media updates in real time. 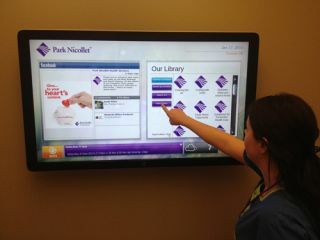 "With our new digital signage network, patients can now access interactive materials directly from their rooms just as visitors are able to retrieve information on clinic staff, find their way throughout our facility, and much more," said Sue Coller, Office Supervisor for Park Nicollet Clinic – Champlin. "In addition, the X2O platform's integration with the third-party Cisco player has simplified content management for our staff, and its flexibility enables us to send targeted information to specific screens." The X2O platform facilitates the creation of rich media content for any application. Built using the HTML5 standard, its authoring application features drag-and-drop tools to let users create media-rich channels featuring HD video, still images, 3D animations, PowerPoint slides, and data-driven graphics linked to databases such as SAP and Oracle, Excel spreadsheets, and RSS feeds. The software also provides the cloud-based X2O Channel Designer, which can be accessed from anywhere via a Web browser. In addition, the open X2O platform integrates with third-party media players such as the Cisco IEC 4632.